I haven't finished a card in a few weeks - it has been way too nice to be indoors. So I guess I am happy it is a gloomy day today. There are pieces of half finished cards all over my desk. 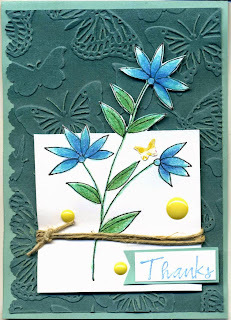 Sometimes I get stumped with how to finish a card and I have to leave it for a while. But I need to reclaim my desk. Today was the day to finish these three. The Penny Black image makes a big card; I will have to use a letter envelope to mail this first one. I colored all three images with Primsacolor pencils while I was watching television. Then I had to match the colors to paper., always a tough job and usually where I get stumped. I found scraps of pink and purple to match the flowers; added a snippet of green ribbon and used butterflies that were in my stash left over from some other projects. The other two are made from part of the image....accidents in stamping but couldn't bear to throw away. This second card is a regular card size. The layer is from a Ranger core'dination stack embossed with a Darise folder. The stack, paper and sticky dot embellishments were all gifts from my friends. The banner for the TAC sentiment was going in the upper corner. I could tell you I didn't want to cover the embossed butterflies with it, but the truth is it is covering a blooper. When will I learn not to put "finished' cards by an open stamp pad? 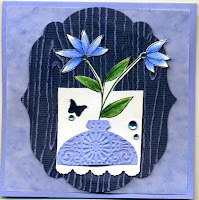 This last one is a small 4-1/4 inch square card. Once again it has core'dination paper, embossed and distressed as a layer but this time it was diecut first. 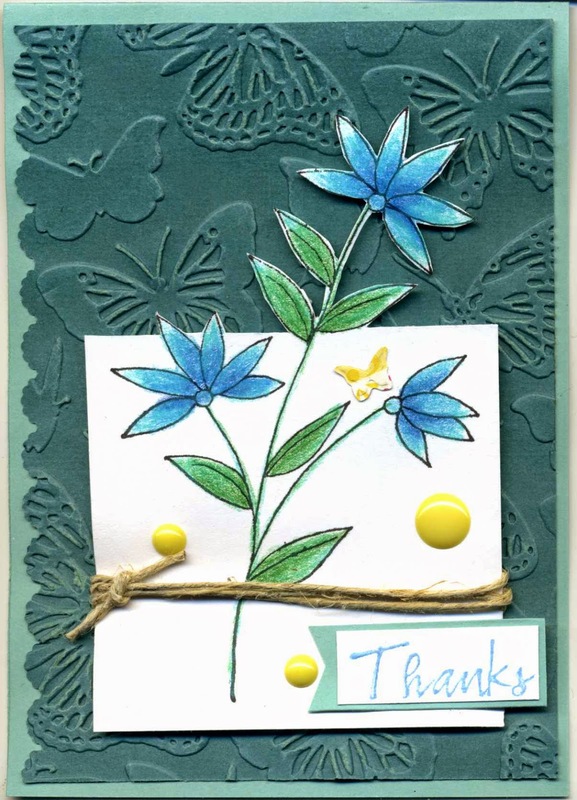 I added a layer of blue vellum that has a faint pattern to break up the blue space of the card. The vase uses an ornament punch cut off at the bottom then embossed with a Cuttlebug folder.. And who doesn't have oodles of gems to use - someone who has more power to resist them in the store maybe. Edit: I am entering this third card at Virginia's View Challenge "layers" and Penny Black Saturday Challenge "nature". A productive day, I think. Its off to Sunday dinner at my sister's house. Wishing all my friends a Happy Mother's Day. Thank you for stopping by. Beautiful Cards! My fav is the first one. Love the colours on that one. Thanks for joining us at PBSC! Good luck!